This entry was posted on July 28, 2017 by molloywp. 5 friends dared to live the dream, when they registered Glendalough Distillery in 2011 (they freely admit to plans being fuelled by late night pints!). Gary, Barry, Brian, Kevin and Donal all recall childhood visits to Glendalough. Records show that monastic sites like this were the birthplace of distilling in Ireland, as early as 584AD. The Glendalough logo features the legend of St. Kevin, out-stretched in prayer, being given a sign by a blackbird. 1 Holstein copper hybrid still imported from Bavaria, nicknamed ‘Kathleen.’ Legend has it that the bold blue-eyed Kathleen tried to seduce St. Kevin, but was converted to the faith. The still was brought in IKEA-style, in numbered pieces, which the boys put together. Apparently it blew a lot of steam from various orifices when it was first switched on! 2012 Glendalough makes its first Poitín. Double-distilled in a copper pot still, it’s made from sugar beet and finished in virgin Irish oak. Awarded a Gold Medal at the Irish Whiskey Awards in 2014. A 2 page spread in The Wicklow People local newspaper, on Geraldine Kavanagh who was running Wild Wicklow Foods, led to a meeting about foraging wild botanicals for Gin. “You do realise the botanicals will change with the season?” she warned… hence Glendalough seasonal gin was borne. 40+ botanicals used in their gins are foraged by hand by Geraldine Kavanagh. 12 months is how long it took to perfect Glendalough Wild Botanical Gin. Customers loved the four seasonal gins, but wanted a year-round version. Their initial thought was to blend the four seasonal gins together. “That would have been the equivalent of mixing a McDonald’s and a curry on the same plate,” said Gary. Launched in 2016, it’s just won a Gold Medal at the San Francisco World Spirits Competition. Every 2-3 minutes, is how often Rowdy, the distiller, dips his little finger into the spirit at the end of each batch of distillation. “It’s a tough job and all that” as he says. As soon as it starts to taste like soapy dishwater, he quickly makes the cut. 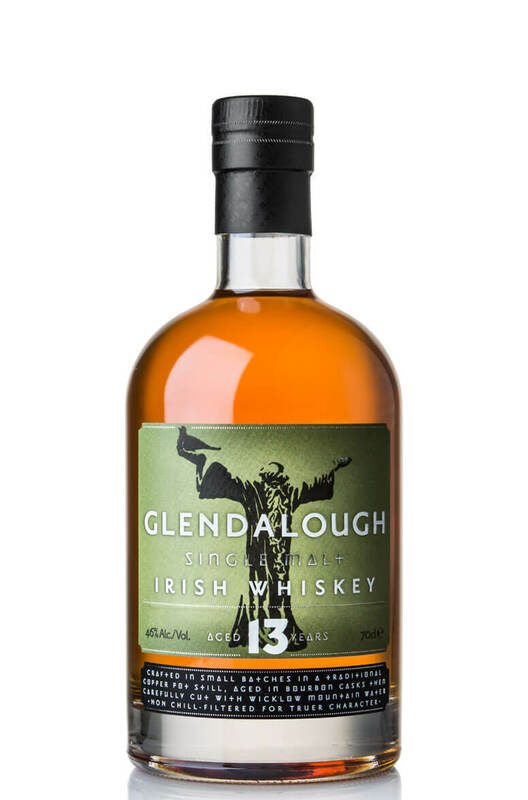 13 year old Glendalough Single Malt. Why 13? It’s a reference the jersey worn by Brian O’Driscoll, who happens to be an investor in Glendalough. (And no, they didn’t pay him. Towards the end of his retirement, he was having a drink in New York’s Brass Monkey Bar, when someone suggested it to him… The boys couldn’t believe their luck!) And the whiskey? Like Brian, it’s a winner – awarded Double-Gold at San Francisco World Spirit Awards 2015. 96.44% is the alcoholic strength of the grain spirit bought in for gin. Trust me, it’s mind-numbingly strong! It’s 100% Irish, and certified GMO-free. It’s cut down with Wicklow water, and gently heated by indirect heat in ‘Kathleen’. Thousands is the amount of juniper berries added per batch of gin. In actual fact, they are cones, rather than berries. We know the real number, but in the spirits of gin-secrecy, have sworn not to reveal it. 2 million visitors come to the monastic site at Glendalough each year. They’ve just purchased a site at the approach to the valley, and have fantastic vision for how they want their new distillery to both blend in, and add to the landscape. 36 countries now stock Glendalough spirits – led by the USA, Ireland, Canada, France, Germany, UK and South Africa. Have you got yours?